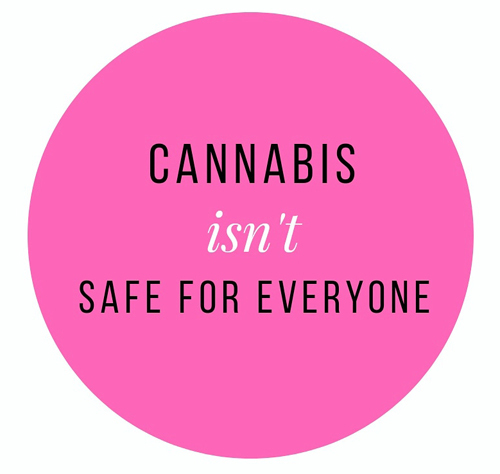 My entire website is to celebrate this wonder plant and the many ways it can help people, however I think it’s important to also talk about the risks. While cannabis isn’t lethal at any dose, THC can have serious side effects for some people who are high risk. My father is a good example, he had a heart aneurysm a few years ago and has to monitor his blood pressure carefully with medication. THC can cause fluctuations in blood pressure, especially from sitting to standing so he probably shouldn’t use THC. THC can also speed up your heart rate, which can be dangerous for people with serious heart conditions, especially those on meds to control their heart rate. THC can make you dizzy, people with vertigo or prone to fainting and dizziness need to be careful when consuming THC. Too much THC, especially when digested can cause muscle weakness, trembling, hallucinations, paranoia and vomiting. That happened to me after ingesting a hash brownie that was too strong, and once after using a very strong concentrate vape pen. I coughed on the inhale and then after I could hardly hold a pitcher of water and ran to the bathroom to vomit. If you have a heart condition and/or are on certain medications, such as blood thinners, you need to speak to your doctor before using cannabis. As always, start low and go slow.